Spooky, scary, creepy, crawly mp3s after the jump. Monster movies are great, but there is nothing like the imagination, jolted by a dose of cheesy drama, to really bring on the shivers. As a kid one of my favorite things to do every Halloween was to scan the record bins at the department store looking for scary records. Sound effects, ghost stories, novelty song compilations - I would save up my allowance for weeks in preparation of the night when I could hide in the basement den with all the lights out, except for a few flickering candles, and scare myself until I pissed my pants (not that ever actually...um, just forget I mentioned the last part). When it wasn't Halloween season, there was always the local library. There I could find copies of old horror and thriller broadcasts from those golden years of radio drama. Again, late nights, darkened room, wet pants (doh!). As I grew older I became obsessed with making Halloween mix tapes that combined everything from garage to punk to spooky blues to old horror movie trailers to...well, Thriller. You kinda have to have Thriller in there somewhere. By this point I had a firm grasp on my bladder. I thoughtlessly left my childhood treasures behind and those mix tapes were all given away. But thanks to this new-fangled thing we call the "internet", I can relive those glory days of spooks and thrills as I complete the cycle of life and head into my Depends years (did I really bring that up again? Sorry). Many spooky souls have taken it upon themselves to share their love of the season. Here are my favorites for each of my three categories of aural Halloween fun: kiddie records, radio thrillers, and mixes. Take some time, turn out the lights and hasten thee to the following bloggers....if you dare! Named for the classically useless kiddie make-up, this is the number one site for spooky Halloween music of old. Jason Willis never got rid of the great records he got as a kid, and has since amassed a truly extensive collection of Halloween recordings. I don't know Jason personally, but this interview makes him sound like a heckuva guy. He is all about spreading the love, er, fear, as each album post features a truly informative essay, as well as a non-expiring zip file of the WHOLE DARN ALBUM. Plan a whole night to sit up late and download 30 or 40 classic chunks of Halloween fun. Wade Denning and the gang at Pickwick made a ton of great Halloween records, but this is one of their all-time classics. I say this not only because I grew up with it, but because it still holds up as a great listen. Each track combines a simple scenario with lots of unique sound effects, a potent combination for letting your imagination run wild. 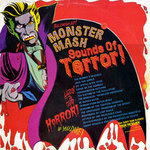 For marketing purposes the album starts off with a rather sedate version of Monster Mash, which does little to signify the real horrors within. Scar Stuff's memories about this album are priceless kiddie lore. Ah, Gershon Kingsley. On the whole, you can't go wrong with his electronic bleeps and bloops. But who knew he had such a grasp on terror? The narration by Peter Waldron is creepy and effective, and this is just another example of how great the Peter Pan children's records could be. Heck, all of side one is pure genius. Two of my absolute favorite ghost story records as a kid, this series from Troll Records (love that name) came into my hands through the Scholastic Book Club (which also landed me all those CYOA books). Mostly classic ghost stories, they are told in such a simple, straightforward style that they just come to life - even when they don't make a lot of sense. And just for fun, I took one of my childhood favorites, "The Guitar", spliced it up, and mixed it over the Billy Childish instrumental "The Axeman Cometh". Enjoy. Caedmon tapped Vincent Price to do a series of simple by delightfully eerie spoken word records in the 1970s. 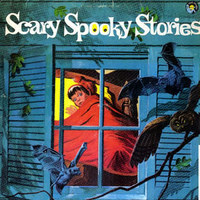 Because they emphasized folklore, these albums were the only scary ones allowed in my elementary school library. This was my first encounter with Vincent Price, and I was instantly enthralled. 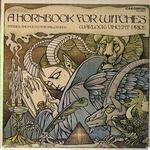 With a hefty emphasis on witches and ghosts, these records mix longer stories with short readings of spells and other occult "facts" (How To Become a Werewolf, To Raise the Dead). It makes for a great listen, and they are pretty swell to have for the album art alone. How to To See Ghosts or Surely Bring Them To You. Okay, that's just a taste. There are so many nice albums up there, I'm sure you'll be up all night downloading. I was. Update, Dec 06: The Scar Stuff site is currently having sever problems, so nothing is downloadable. Keep trying back though...I'm sure he's not going anywhere yet. There are lots of old-time radio show sites out there with a huge variety of shows, but we just want Halloween and horror, right? Well, then, I recommend heading over to Old Time Horror Radio at Monster Club, which has many of the best shows available on mp3, all for free, and all an easy click away. All the big guns are here: Vincent Price, Boris Karloff, Peter Lorre, even the Father Knows Best Halloween Special and, of course, The War of the Worlds broadcast. I recommend giving a listen to the Suspense episode "Ghost Hunt" - which follows a hipster disc jockey, Smiley Smith, who stages an on-air stunt to stay the night in a haunted house. Never ever ever a good idea, and the drama as our DJ goes slowly crazy is pretty intense. Best of all, they have a ton of my absolute favorite horror show: Lights Out. Host Arch Oboler (the second host, actually) was a true maverick who conquered every medium in his own inimitable style. Oboler was as big a radio personality as Orson Welles, and he went on to make Bwana Devil, the film that started the 3-D craze in the 1950s. 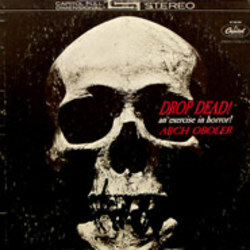 In 1962 he returned to recorded drama and made what I consider his crowning glory: Drop Dead - An Exercise in Horror. This is the absolute perfect after dark listen, mixing all the horror styles in a "best of" selection from his radio shows (though from what I can tell, rerecorded for this album). But most of all - what a title! And just look at that cover. What more could you possibly want from the front of a horror record? Sheer genius. No blog to link you to for this one other than the one you're on right now. So, here is the full album. The great Reverend Frost, who as far as I can tell really does live in South of Hell, France, runs one of my favorite music blog sites. His constant flow of obscure rockabilly, r&b, and what-have-you is not only incredibly informed - the songs he posts are almost uniformly great! Every day is like Halloween over at his blog, thanks to the always gogeous horror movie images that accompany each post, so it makes sense that the Halloween season is when he really starts to go hog wild. 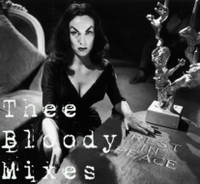 A few times a year, the Reverend pops out a "Bloody" mix, which features a high concentration of music, movie trailers, sound effects, and everything else pureed together and poured into an mp3. This year he has taken his annual Halloween mixes one step further and offered up 5 new mixes (four of which have already been posted - the final one is coming on Saturday). He uses RapidShare for downloading, which is free but pesky, but then he archives them all for download on his Bloody Mixes site. I've re-posted two of my recent faves below. Get your Halloween party started right. Again, I'm just listing a sampling of my favorites - my desert island websites if you will. Of course there are many other great sites for Halloween music (for instance, I haven't even had time to start pouring over Senses Working Overtime's 31 Days Of Halloween). You can find the best horror music sites by following the suggested links from Scar Stuff and Reverend Frost. I hope you find them enjoyable as well. Thanks for your blog. hey!, you don't have any links to the "Scary Spooky Stuff" record. that one has the legendary "Skinny Toe" story in it. Aw, man! I thank you from the bottom of my little baboon heart for all the kind words here, and I'm so glad to see the site finding its way into the, you know, right hands. In fact everyone mentioned here is doing really great stuff -- it's amazing to me how much cool spooky audio sprung up online this year & I'm pleased to've been a part of it. Oh and hey, if I may be so bold here, lemme just try & call extraspeciallookatme attention to the two compilation discs I made: Spook Party & Ghoul-Arama. Throw 'em alongside other great comps like the new Oddio Overplay collection & Reverend Frost's supercool mixes & you could even have something of an Instant Spooky Happening. In fact maybe in a pinch they could even function as a something of a condensed version of the whole damn Scar Stuff site, just kinda layered all on top of each other with music. Well, and wind. I might've overdone it on the wind. Dano - I fixed that link - and updated the Great Ghost Stories section to include both albums. I got them as a set and they bleed together in my head anyway. I also added The Skinny Toe to the post, because you are right, that one is just plain great. Jason - so good to hear from you! I wanted to mention your mixes as well, but didn't want to overcrowd the post. I really enjoy them - and I love the over-dub versions of some of the songs more than the originals (The Fall's "The Mummy" is a great song, but so much better with the added sound effects). Thanks also for pointing folks to Oddio Overplay - great mixes there as well. its sad we all don't have "The Skinny Toe" on vinyl like my fourth grade library study did because you can set the record at a higher speed and it becomes absolutely hilarious with a high pitched machine gun fire delivery.. Here is Skinny Toe on 45rpm! You're right - it sounds great on fast speed. And the story is so naturally slow, that it is still listenable...and not at all scary. Thanks for these!! I didn't even know I had a Bejeezus until "The Dark" scared it out of me as a kid when I heard it on the radio (WAMU?) -- and it's still creepy as hell. Oh man, DanO. We had some good times with those high speed "Skinny Toe" listening sessions. Everyone had their headphones on, sitting around a table and giggling hysterically. Don't forget the slowed down version too: whoooooooose gaaahhht maaaaaaaai skeeeeeeeny tooooooohhhhh-uhhhh!? I linked to this post for my "Halloween Faves" picks in my role as the Journals Editor, as well... I'll be listening to this stuff for weeks. "The best kids book and record ever. I took my old GI Joe book and record and scanned in all the pictures. The I made the mouth for each picture by drawing them in on paint shop pro. Then I laid each frame into the movie maker program and mixed it with the audio from the record. So I basically animated this but just the mouths mostly." Just an FYI - I am currently in the process of re-posting all of Jason's Scar Stuff LPs (with his full knowledge of course). I'm about 80% done now. You can find the link to my blog in this post. Thanks for this great website!!! WOW......I finally have "The Golden Arm" and "The Skinny Toe" on CD!!!! These use to scare me horribly as a child many,many,many moons ago. I can't wait to surprise my older brother. Thank you for these. Do you have soundtrack of series from Alfred Hichtcok? I love this page! I've linked to you to share the work you've done gathering these great Halloween classics. Thanks a ton! OMG! I've just finished listening to "The Skinny Toe" speeded up....I used to listen to this record at the Wolfgang's house in the late 70's when we were kids! We also used to speed up the record for this story. We would really creep ourselves out and run like hell down the hall at the scary parts. Now I just need to get my hands on a complete copy of Scary Spooky Stories. The link above is dead! Thanks for the great information - just bookmarked your website. does anyone have Scary Spooky Stories album available to download? Here's some fun Halloween music on this blog,that will curl your tail.Lots of old and NEW and OLD scary music.